Imagine that you wanted to explore a world in our solar system and had the budget to actually fly a mission. Would you chose to orbit your world and make measurements across your world? Would you chose to land and make much more detailed measurements but only within the few square meters assessable from your lander? For scientists proposing missions to NASA, these are very real trade-offs they have to make. A scientist who’s leading a proposal to explore the two small moons of Mars and I have been chatting on e-mail. He has shared the reasoning that led his team to pick particular choices on how their mission, if selected by NASA, would be implemented. Those choices are quite different than those selected by two other teams proposing missions to these moons. It’s an insight into the creative thinking process that leads to the basic decisions about what kind of mission would best answer a science team’s questions. Every few years, NASA holds a competition for its Discovery program, its cheapest class of planetary missions. Teams compete for $450 million in funding available to design, test, and build their spacecraft. (NASA pays for the launch and operations of the mission separately.) The competition to select the 13th Discovery mission is in progress. The tight budgets mean that missions can’t do everything and instead must be carefully focused. Achieving great science requires creativity. 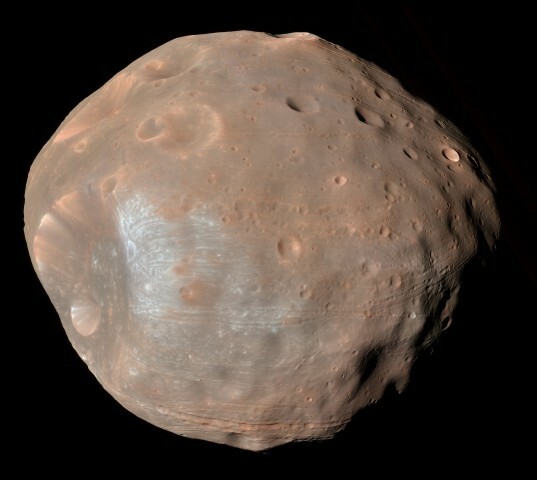 Mars Reconnaissance Orbiter approached to within 6,800 kilometers (4,200 miles) of Phobos to capture this enhanced-color view of the Martian moon on March 23, 2008. The two tiny moons of Mars have been favorites for proposers in several Discovery competitions, although none have been chosen by NASA to fly. In the current competition with a total of 28 proposals, three teams have proposed missions to explore Mars’ two small moons. Why so much interest in these two tiny bodies? There is the mystery of their origin. Are they captured asteroids (in which case their color suggests they may be rare primitive bodies)? Are they material left from the formation of Mars? Or are they material blasted into orbit from asteroid strikes on Mars’ surface? Any of these choices makes them interesting scientific targets. (See this article or this article for background on the scientific debate about these moons’ origin.) A second reason for the interest is that these moons may serve as initial targets for human exploration as we build the skills and technologies to enable missions to the surface of Mars. It also doesn’t hurt that Mars and its moons are relatively easy to reach. We’ll look at one of the three proposals in depth, but first let’s look briefly at the other two proposals. A word of caution, however: Because so much more detail will be provided for the third mission proposal, it would be easy for us to say, of course, it is the obvious choice. However, if we had equal detail on those other missions and their trade-offs on science, complexity, and cost, then we’d likely be left scratching our heads and saying this is a tough choice. The Phobos and Deimos and Mars Environment (PADME) mission would be a small spacecraft that would orbit Mars and make 16 flybys of Phobos and 9 of Deimos. The craft would carry a suite of cameras that would take images with resolutions as small at 2.8 centimeters to study fine scale features and the processes that formed them. During the flybys, a neutron spectrometer would remotely measure surface composition while a mass spectrometer would directly measure the composition of surrounding dust particles ejected from the surface. Tracking the radio signal during flybys would provide information on the gravity field, and therefore the interior structure of the moons. The Pandora mission, in contrast, would orbit both of the moons for extended studies at each. The Pandora spacecraft would use cameras, an infrared spectrometer, and gamma-ray and neutron spectrometers to remotely image the surface and study the composition as well as use radio tracking to study the interior structure by mapping the moons’ gravity fields. The mission that we will examine in some detail, the Mars-moons Exploration, Reconnaissance, and Landed Investigation (MERLIN) makes a different set of trade-offs. The MERLIN team proposes to carry just a camera, a simple dust counter, and a radio tracking system for remote studies done during flybys past Deimos and in orbit around Phobos. Its remote sensing studies of these two small worlds would be less comprehensive than either PADME or Pandora's. However, the MERLIN spacecraft would land twice on Phobos in areas that appear to have different compositions (the so-called "blue" and "red" materials). 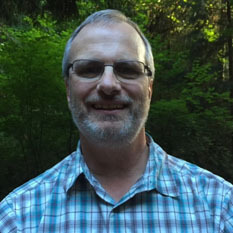 In my emails with Scott Murchie, the principal investigator for MERLIN from the Johns Hopkins University Applied Physics Laboratory, I asked him why his team chose to undertake the added complexity of designing a spacecraft for both remote studies and landings. Their choices hinge on two factors. First, instruments that can be placed directly on or just above the surface of a world can make more precise composition measurements than those made by a spacecraft during a flyby or in orbit about a world. Second, more precise studies of the interior can be made from a spacecraft on the surface of a small body than from flybys or in orbit. A key goal for any mission to the moons of Mars is to make composition measurements that are accurate enough to relate them to meteorites found on Earth that have been studied in exquisite detail, and therefore distinguish between the different possible origins of these moons: the outer solar system if these are primitive asteroids, the bulk material that formed Mars if these are fragments left over from that planet’s formation, or similar to the composition of Mars’ surface if these moons formed from material blasted into Mars orbit by asteroid strikes. The teams proposing PADME and Pandora argue that measurements made from flybys or in orbit would be sensitive enough to measure the composition in sufficient detail to tie these moons uniquely to one of the meteorite analogs and therefore determine their origin. The MERLIN team decided to forgo richer composition measurements from flybys or orbit because of what is known as the mixed pixel problem. To explain this point, I’ll use an analogy. This past spring I was on a beach that from eye level appeared to be covered by a uniform tannish sand. However, when I scooped up the sand in my hand, I could see that many of the individual grains of sand were red, white, or black although most were brown. However, those fine composition distinctions were lost when my remote sensing instruments—my eyes—scanned across the beach. At the resolution I could see standing, the colors of the individual grains mixed together. Similarly, spacecraft that flyby or orbit these moons will see average compositions for each of their instrument pixels, which will see detail down to a few centimeters in images and at poorer resolutions for other instruments. The MERLIN team believes that much of the story on how these two moons were formed and evolved are contained in the detail on the much finer scale of individual grains of surface material. Only a lander can see this detail. 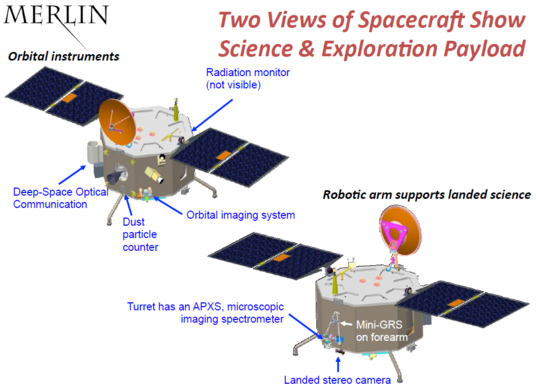 To examine Phobos on a grain-by-grain basis, the MERLIN spacecraft will carry a microscopic imaging spectrometer. This instrument will be placed just above the soil and will image it in sufficient detail to see individual grains. Whereas a normal camera measures just three colors for each pixel, this instrument will take full spectra that measure many "colors" in for each pixel. From the spectra, scientists will study the minerals present in each grain. Examples of the detail and spectroscopy the MERLIN microscopic imager would perform. 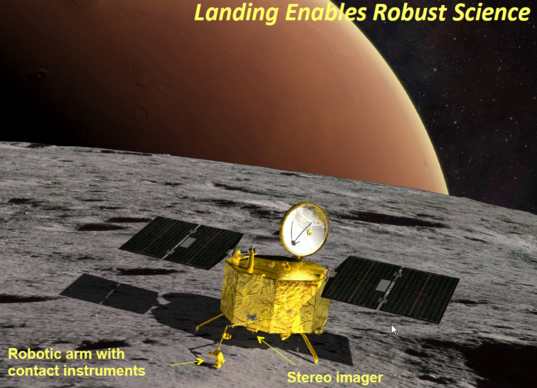 By landing on Phobos, the MERLIN team also plans to make much more detailed measurements of the elements that make up this moon than can be done remotely. The spacecraft will carry one instrument, an alpha particle x-ray spectrometer (APXS) that only can be used when it is placed directly in contact with the surface. (All of NASA’s rovers on Mars have carried versions of this instrument.) A second instrument, a gamma-ray spectrometer, also will measure the elemental composition. Both PADME and Pandora will carry versions of this instrument, but their sensitivity is limited by how close they can get and how long they can measure a particular location from flybys or orbit. MERLIN’s instrument will be able to stare from very close range at the same small spot for months at each landing site. In his emails, Murchie explained the advantages that he believes landing provides. "The minerals most diagnostic of origin are carbonates, olivine, and organics. These are all minor phases and could only be seen as individual grains. MERLIN does carry an imaging spectrometer. It is a microscopic imaging spectrometer on the arm that will distinguish individual grains, and its [spectral] wavelength range covers absorptions due to all these phases." "Very closely similar meteorite analogs are also distinguished by small differences in abundances of volatile elements, especially carbon, sulfur, zinc, manganese, and hydrogen. MERLIN's APXS on the arm measures sulfur, zinc and manganese, and maybe carbon. The landed gamma-ray spectrometer gets a very strong signal because it's not limited by time within one [Phobos] body radius, the usual limitation on the signal to noise ratio for gamma rays. It sits on the surface for months and gets very sensitive measurements of carbon, hydrogen, and sulfur. Between the two investigations we'll measure 20 elements which is far more powerful than the three to eight measurable from orbit to distinguish proposed compositions." "The imaging spectrometer will map hydrogen at the grain scale so we can see if it is linked to specific minerals and intrinsic to the moon, or a surface coating painted onto everything by the solar wind. The microscopic imaging spectrometer and landed stereo imager will together do a phenomenal job of measuring particle size and texture." Another way the MERLIN mission would differ from its competitors is in how it would study the interior of Phobos. All three missions will use the tracking of the spacecraft’s radio signal to measure the gravity of these two moons and hence how their mass is distributed internally. These studies can more precisely be done from orbit than from flybys. PADME would do flybys of both moons, Pandora would orbit both, and MERLIN would flyby Deimos and orbit Phobos. In mission design, there rarely are free lunches, and the MERLIN mission takes on additional complexity that its competitors do not. It must be able to function both as a highly capable spacecraft and a fully functional lander. The latter requires, among other things, that the spacecraft be able to track its descent, have batteries that will keep the spacecraft functional during nights on the surface, and an antenna that can track Earth from on the surface. One of the team’s approach to managing the overall mission complexity is to use existing instrument designs for most of the scientific payload. The spacecraft’s main camera that will image Deimos and Phobos during flybys and orbit is a simplified version of the camera used on the Mercury MESSENGER orbiter. The cameras used on the surface will be a copy of the 2020 Mars rover’s color Hazcam cameras. Murchie told me, "two of the instruments are flight spares, and three are really cheap. Their power comes from getting close." As for the landing itself, "Landing on Phobos is the easiest landing of any planetary body. There is no Mars-like entry, landing, and descent. We land at a few centimeters per second, taking so little fuel that we do a practice down to 100 m, then a few weeks later land for real, and if needed there is plenty of fuel for a third landing. It's not 7 minutes of terror, it's 70 minutes of boredom. But there is enough gravity that the spacecraft weighs enough for "normal" (albeit snail-like) operation. No need for harpoons. We call it landing in the Goldilocks zone (of gravity)." After the bounce the Philae lander did when it tried to land on a comet, another small body, I asked Murchie about this. "Gravity is about 2 orders of magnitude higher on Phobos [than on the comet]. Philae landed in a free fall, and bounced because its harpoons (required for the low gravity) failed to deploy. MERLIN on the other hand has a controlled descent to negate the terminal velocity, landing at less than 10 cm/s. The landing gear absorb most of what little shock there is. We've analyzed the bejeepers out of the landed configuration. With regard to bounce, we've looked at that and on account of Phobos' much higher gravity, spacecraft design, and controlled descent, bounce is expected to be less than 7 cm. Yes centimeters. Further, we target one of several dozen areas with low regional slope. We've modeled landing on a surface in one of these areas that has a block abundance like those measured on Phobos, Eros, or Itokawa, using a NASA-developed autonomous landing and hazard avoidance technology—the probability of landing with a stable orientation is much greater than 99 percent." In the end, it appears that NASA has three good proposals to explore the Martian moons. All three would address the key questions of composition and internal structure that should reveal the origin of these moons and much about the nature of small rocky worlds. While this post has emphasized the unique traits of the MERLIN proposal, each of the other two have their unique strengths, too. There is no single or right way to explore the Martian moons. PADME offers simplicity and low cost. Pandora offers a thorough reconnaissance from orbits of both worlds. MERLIN offers in-depth analysis of two and possibly three landing sites on Phobos but only flybys of Deimos. These three very different proposals emphasize the creative aspect of designing planetary missions. Within the tight budget of a Discovery mission, no mission can do it all. Each of these three teams had to make choices about which measurements to emphasize and which to forgo. Behind almost every description of a real or proposed Discovery planetary mission, you will see the creative act of deciding how to meet tough scientific goals within a tight budget. NASA’s managers expect to pick finalists in September for further study from among the 28 Discovery proposals that were submitted to explore worlds ranging from Venus to Saturn’s moon Enceladus. These (typically three) semifinalists will be those that combine both the absolutely best science with the most solid technical proposals. We will learn then if the choices made by the MERLIN team, or the other Martian moon teams, provided the right combination of both. Selection of the final mission should come late in 2016 with the mission to launch by the end of 2021. You mention low cost as an advantage of PADME. If two missions' (risk-adjusted?) costs are different, but both below the cap, is this counted in the evaluation? Or is cost ignored once the cap is met? I would have thought that if cheapness is a factor, we'd see more lunar missions winning. As I understand the selection process, the finalists are those few missions that receive top ranking for the importance and quality of their science *and* top ranking for being able to be implemented within the cost cap. That's a tough act and I understand that only two to four proposals each time make the cut. The final selection is made by NASA's associate administrator for science and we know less about his criteria. In the last two competitions, with the lunar GRAIL and Mars InSight missions selected, some in the planetary community felt that NASA was putting too much emphasis on lower cost and risk. <"The MERLIN team proposes to carry just a camera, a simple dust counter, and a radio tracking system"> Why is this stuff so ridiculously expensive? Couldn't just a couple of those million dollars be used to add some other instrument? What is driving this huge cost, is it extortion? Thank you. So the criteria are not published, at least in detail. Presumably the bidders get more information (so there must be an Expression of Interest process?). I always wonder how you tell what the science value of a mission is, given that a) it's science and so by definition unknown and b) the field is so diverse - how do you compare KBO occultation events with Phobos investigation? I think marking the bids would be my dream job - except perhaps helping to write one.